Contrary to what might rightfully now be popular belief, I read grown up books, too — well, sort of. I’ve been a little silent since I had a bit of a deadline for some reviews for the San Francisco Book Review. I’ve been quite busy immersing myself in Resisting the Enemy by Lorraine Campbell, The Time Roads by Beth Bernobich, The Only Thing to Fear by Caroline Tung Richmond, and Grail Knight by Angus Donald. 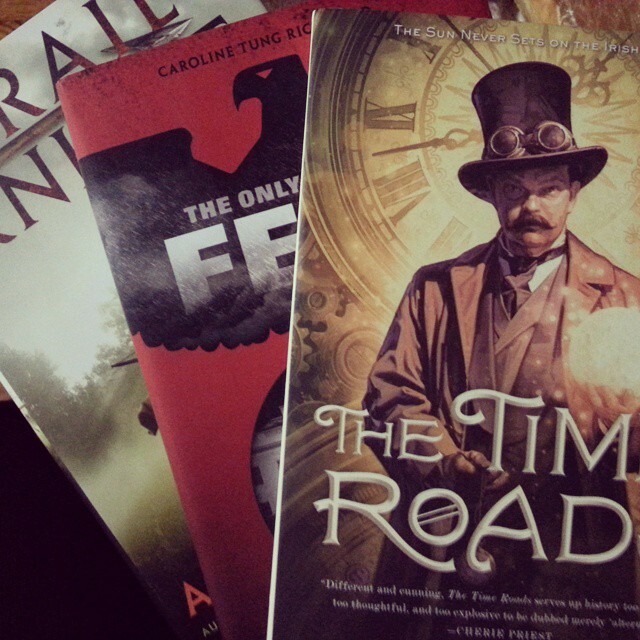 From Robin Hood and his quest for the Holy Grail, to World War II and clandestine missions, to alternate historical worlds in which Hitler may have conquered the Americas, and a little time travel with steam-punk flare to ensure it all makes plenty of sense, these books have been a really fun read. The reviews will be available in January’s edition of the San Francisco Book Review. I now hope to get to a few other stories I’ve been meaning to delve into… and a little Rick Riordan, too, of course!